A powerful, active packed serum designed to illuminate and brighten skin suffering the effects of hyperpigmentation caused by aging, hormonal fluctuations and UV exposure. This clinically tested and proven formula contains 12 active brighteners to help break up and reduce the appearance of existing pigmentation and discourage new dark spots from forming. NeoGlucosamine enhances exfoliation and fade existing skin discolorations. A potent pigment reducing peptide, enhanced with Licorice Extract, Vitamin C and 7 Alpine Plant Extracts inhibit tyrosinase and melanin production to leave skin tone more even, brighter and luminous. Used twice daily, it is possible to start observing improvements to your skin within 4 weeks. Formulated specifically for olive to black skin tones, this high-performance anti-dark spot serum visibly reduces the appearance of all pigmentation marks, including age spots and traces of hyperpigmentation remaining after skin trauma or injury, such as breakouts, scars and other lesions on the face and body. There are four active ingredients that tackle the four factors involved in the formation of dark spots and the lightweight serum provides targeted action to lighten dark spots, without depigmentation of the skin around them. Aqua (water), glycerin, propanediol, sodium polyacrylate, bisabolol, bakuchiol, polyglyceryl-2 stearate, phenethyl alcohol, glyceryl stearate, caprylyl glycol, stearyl alcohol, xanthan gum, polysorbate 80, alcohol, undecyl alcohol, ethylhexylglycerin, parfum (fragrance), tocopherol, citric acid, lecithin, sodium phytate, cardiospermum halicacabum seed extract, glycine soja (soybean) oil, phenoxyethanol, pancratium maritimum extract, tetrapeptide-30, soy isoflavones, lepidium sativum sprout extract, glyceryl caprylate, phenylpropanol, palmitoyl sh-octapeptide-24 amide, glycolic acid, lactic acid, polyvinyl alcohol, palmitoyl sh-tripeptide-5 norisoleucyl sh-nonapeptide-1, coumarin, benzyl benzoate, geraniol, citronellol, linalool, limonene. *Clinical study results conducted under dermatological supervision for 56 days on 21 female subjects ages 26 to 59, with olive to black skin tones and pigmentation spots on the face (induced by sun, acne or melasma). Application in the morning and evening. Even Tone Correcting Serum is technologically advanced clinically proven anti pigmentation serum, featuring the patented b.r.y.t. complex by skinbetter. This serum is a ground-breaking, non-hydroquinone, non-retinol formula that delivers a visibly dramatic reduction in the appearance of hyperpigmentation. Housed in a sleek pump airless pump bottle, the ground breaking formula with key skin brightening actives such as Hexylresorcinol, acetyl glycyl beta-alanine and alpha-arbutin improves the quality of skin as well as delivers a healthy radiant glow. 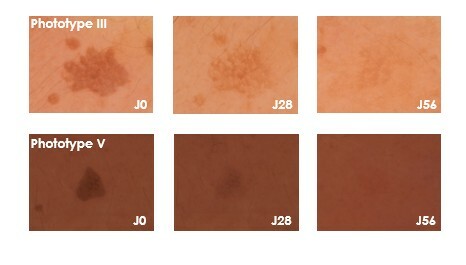 In clinical trials, after 12 weeks of use 96% of users reported an overall improvement in the appearance of their skin and overall skin tone.